The Rev. 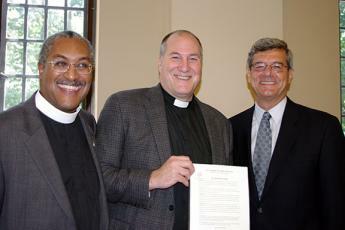 Bernard W. Poppe, center, was congratulated at coffee hour by two special guests -- the Rev. Canon Gregory A. Jacobs, Canon to the Ordinary of the Diocese of Newark, and the Hon. Victor DeLuca, mayor of Maplewood, NJ. Bernie is holding a proclamation from the Mayor and Township Committee. On September 29, 2002, the Rev. Bernard W. Poppe led his first service as Rector of St. George’s Episcopal Church in Maplewood, NJ. I had the privilege of serving on the search committee that called him, and I still remember how he started his first sermon. The parish had been through a rough period — another priest had accepted our call, then resigned before ever taking the pulpit, setting up a second, 18-month search process. Fortunately our church has a history of strong lay leadership, which sustained us during three years with two excellent interim rectors. So on that Sunday morning we all watched with great anticipation as Bernie stepped into the pulpit to preach for the first time as the seventh Rector in what then was the 97th year of St. George’s. His opening gambit was greeted with laughter and applause, and the laughter and applause continued today, a decade later. Congratulations to Bernie and to the people of St. George’s, for building a vibrant ministry together. It’s funny how each candidate’s biggest gaffe revolves around the topic of government dependency. When Barack Obama said “If you’ve got a business — you didn’t build that. Somebody else made that happen,” he displayed both a scorn for individual achievement and a reverence for the role of government. 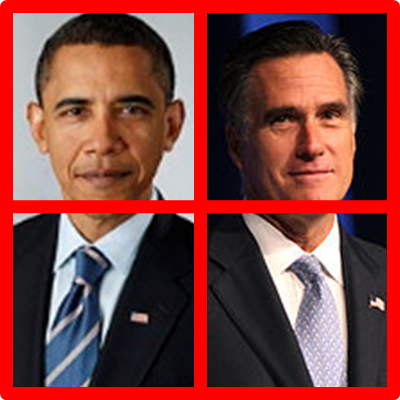 When Mitt Romney clumsily conflated two overlapping-but-separate populations that each weighs in at 47% — people who pay no income tax and people who will vote for Obama “no matter what” — he displayed a scorn for dependency on government and a reverence for self-reliance. Romney is correct that there are people “who are dependent upon government, who believe that they are victims, who believe that government has a responsibility to care for them, who believe that they are entitled to health care, to food, to housing, to you name it. 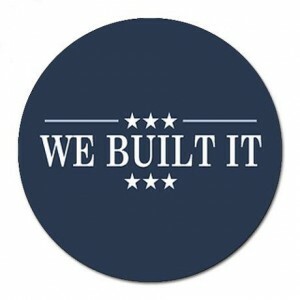 That that’s an entitlement.” That doesn’t describe every Obama voter, as Romney carelessly implied — but the people it does describe most certainly will support Obama. The election offers a stark choice between competing visions of the proper role for government. The outcome may hinge on whether voters focus on the gaffes or focus on the underlying conflict. 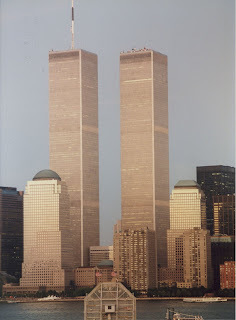 I’ve published this every September 11 since I began blogging in 2008. It’s dedicated to the men and women of the United States armed forces, and to every firefighter who has ever run into a burning building — 343 of them in particular. Regardless of who said it first, that sentence is the purest possible distillation of my worldview, and September 11 is a powerful annual reminder of why I regard it as an enduring truth. The events of 9/11 were the legacy of more than two decades of doing nothing, or next to nothing, in response to attacks from fascists in Islamic guise. Militant Islamists declared war on America in November 1979 by taking hostages at the U.S. embassy in Tehran. This was followed by 1983 attacks on the U.S. embassy and Marine barracks in Beirut; the Pan Am 103 bombing over Lockerbie in 1988; the first World Trade Center bombing in 1993; the Khobar Towers bombing in 1996; the simultaneous 1998 U.S. embassy bombings in Kenya and Tanzania; and the attack on the U.S.S. Cole in 2000; along with smaller atrocities too numerous to list. Only after 9/11 did America, led by a President who despite his substantial flaws was resolute enough to call evil by its name, finally mount a sustained response and take the battle to the enemy. And no, Saddam was not behind the 9/11 attacks — but liberating Iraq and planting a (still-fragile) democracy in the heart of the Islamic Middle East is an essential part of the broader war. All of this is why, despite profound disagreements with the Republican Party on social issues, despite voting for Bill Clinton three times (including 2000), I can no longer vote for Democrats for President. Not until the party has a standard-bearer who understands the cost of meekness in the face of fascism, and who is prepared to stay on the offensive against people for whom “death to America” is not a metaphor. 2012 update: Obama has turned out to be more willing to use force than I expected when I wrote the last paragraph above during the 2008 campaign. The takedown of Osama bin Laden was a genuine triumph. But at the end of the day, economic strength is also a national security issue, and I’ll feel (somewhat) safer on that front with Republicans in charge. Why Do People Make Tendentious Statements As Though They Were Established Fact? An op-ed teaser on the homepage of the Washington Post this morning promised to explain “Why the presidential campaign is so negative.” To my mind there’s a fairly simple answer — because negative campaigning works — but I clicked through to the column to see if the author could put some flesh on those bones. Drew Westen, a psychology professor at Emory University, describes a message grid with four quadrants — the positive stories each candidate tells about himself, and the negative stories each tells about the other candidate. He offers bipartisan examples of positive messages that have been successful in the past — Bill Clinton as “the man from Hope” (Arkansas) and Ronald Reagan’s famous “Morning in America” ad. As a long-time PR guy, I see Westen’s grid as a useful intellectual construct, and I read on. In 2008, for example, the Republican nominee, Sen. John McCain, pulled ahead of Obama for the first time at the beginning of September, in part because Obama sought to run almost entirely in one quadrant of the grid — telling his own story and rarely mentioning the name of his Republican predecessor, George W. Bush. Although that might seem virtuous, it would probably have seemed less so if McCain had won the election and continued many of the policies that destroyed the economy. Gracious. However fervently Professor Westen may believe that Republican policies were responsible for the financial crisis, that’s an opinion, not a fact. It’s a storyline that fits squarely into one of Westen’s quadrants. In another quadrant, some of us would argue that the 1977 Community Reinvestment Act played a major role in the housing crisis that damaged (not “destroyed”) the economy, by providing mortgages to a lot of people who were not financially able to pay them. CRA was championed by Democrats, signed by President Carter, and tinkered with over the decades by Republicans and Democrats alike*. By changing just a few words, Westen could easily have couched his statement as an opinion. With a few more words, he could have mentioned and found fault with particular Republican policies. But by taking his partisan shot in an “everybody-knows-this” tone of voice, he lost me. It’s like the friend who once started an argument, during the closing months of the second Bush presidency, with the words “now that George Bush is generally agreed to be the worst president in history…” The mind reels, and everything that follows is tainted. As an overlay for Professor Westen’s grid, I would distinguish between “messages intended to arouse the base” and “messages intended to persuade the persuadable.” To me, opinion writing is about persuasion, and on this blog I try, not always successfully, to treat opposing viewpoints with respect. I was a lifelong Democrat until I became a 9/11 Republican, and I see liberalism and conservatism as two potent and worthy champions in the clash of ideas that has helped make America the most powerful and successful country in the history of the world. People who treat the opposition as fools or knaves or worse need to understand that they’re not likely to change any votes that way. Photographs from Wikipedia. This post initially stated that the CRA was signed in 1997, it has been corrected above to 1977. This is brilliant — a compilation of near-identical sound bites from Obama’s campaign speeches in 2008 and 2012. Well worth a minute & 58 seconds of your time. If Obama loses in November, it will be because late deciders and marginal 2008 supporters realize that Obama is not the Obamessiah — he’s one more politician who makes promises he can’t keep. maksud jam tangan original bm on What’s the Matter With Islam?